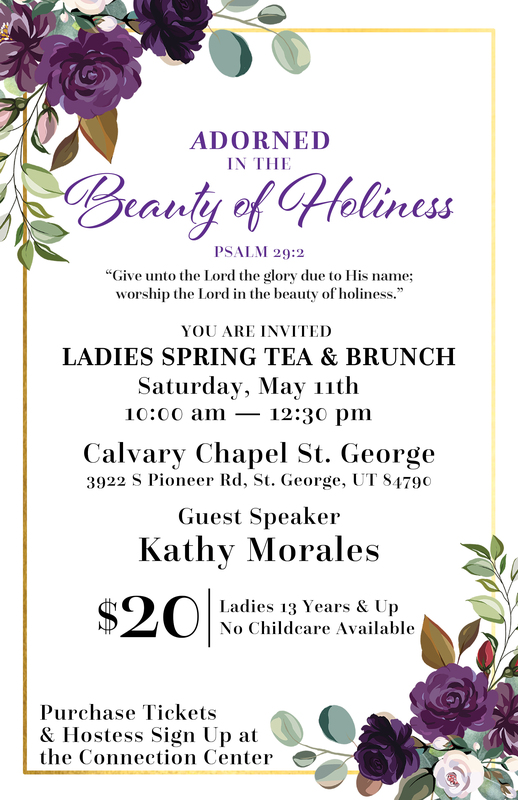 The Spring Tea & Brunch will be hosted at Calvary Chapel St. George, from 10 AM – 12:30 PM. For ladies 13 years and up. We will be joined by guest speaker Kathy Morales. We are so excited and hope you are too! Tickets for the event will go on sale April 7th at the Connection Center for $20. Hostesses can also sign up at the Connection Center. Please note: there will not be childcare at the event. The cost is $20, please purchase your tickets at the Connection Center. Print the flyer to invite someone!